The upper arm and shoulder constitutes of two compartments – Anterior and Posterior. The Anterior compartment includes biceps brachii, coracobrachialis and brachialis while the triceps brachii is a part of posterior compartment. Upper arm is located between elbow joint and the shoulder joint. The muscles of arm and shoulder are designed to satisfy the diverse needs of strength, speed, and precision when of the body completing tasks that were complex. Activities like boxes or lifting weights need strength in the arm’s muscles. Biceps brachii, coracobrachialis and brachialis. 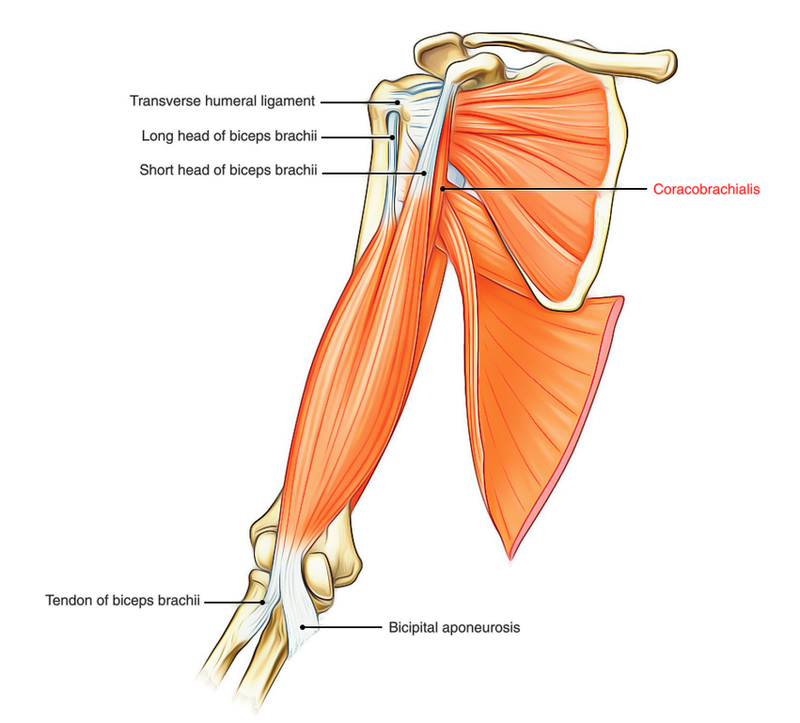 Biceps brachii Short head from tip of the coracoid process of the scapula. Long head from supraglenoid tubercle of the scapula. Posterior rough part of the radial tuberosity. Musculocutaneous nerve Supination of the forearm when elbow is flexed. Flexion of the forearm when elbow is extended. Coracobrachialis Tip of coracoid process of the scapula along with short head of biceps. Middle one-third of medial border of the humerus. Musculocutaneous nerve Helps in flexion and adduction of the arm. Radial nerve Flexion of the forearm in all positions. Long head emerges within the capsule of shoulder joint from supraglenoid tubercle. Its tendon arises from the joint through intertubercular sulcus running above the head of humerus. Short head emerges from the tip of the coracoid process along with coracobrachialis. The two heads join together in the distal third of the arm to form a belly that ends in a tendon, which gives off the bicipital aponeurosis from its medial aspect, opposite the bend of elbow. the deep fascia on the medial aspect of forearm by its aponeurosis (bicipital aponeurosis). The aponeurosis protects the underlying brachial artery and median nerve. By musculocutaneous nerve (C5, C6, and C7). It is strong supinator of the forearm, when elbow is flexed. This action is used in screwing movements such as tightening the screw with screw driver. It is a powerful flexor of the forearm, when elbow is extended. It is also a weak flexor of the shoulder joint. The biceps brachii is tested by asking the patient to flex the elbow against resistance when the forearm is supinated. In this act, the muscle forms a prominent bulge on the front of the arm. Biceps reflex: It is tested during physical examination by tapping the tendon of biceps brachii by reflex hammer with forearm pronated and partially extended at elbow. The normal reflex is brief jerk-like flexion of the elbow. The normal reflex confirms the integrity of musculocutaneous nerve and C5 and C6 spinal segments. From the tip of coracoid process of the scapula along with short head of the biceps brachii. Into the middle of the medial border of the shaft of the humerus. It is a weak flexor and adductor of the arm. Circular shaft of the humerus becomes triangular below this level. Basilic vein pierces the deep fascia. Median nerve crosses in front of the brachial artery from the lateral to medial side. Radial nerve pierces lateral intermuscular septum to pass from the posterior compartment to the anterior compartment. Ulnar nerve pierces medial intermuscular septum to go into the posterior compartment. Medial cutaneous nerve of the arm and forearm pierces the deep fascia. Nutrient artery pierces the humerus. 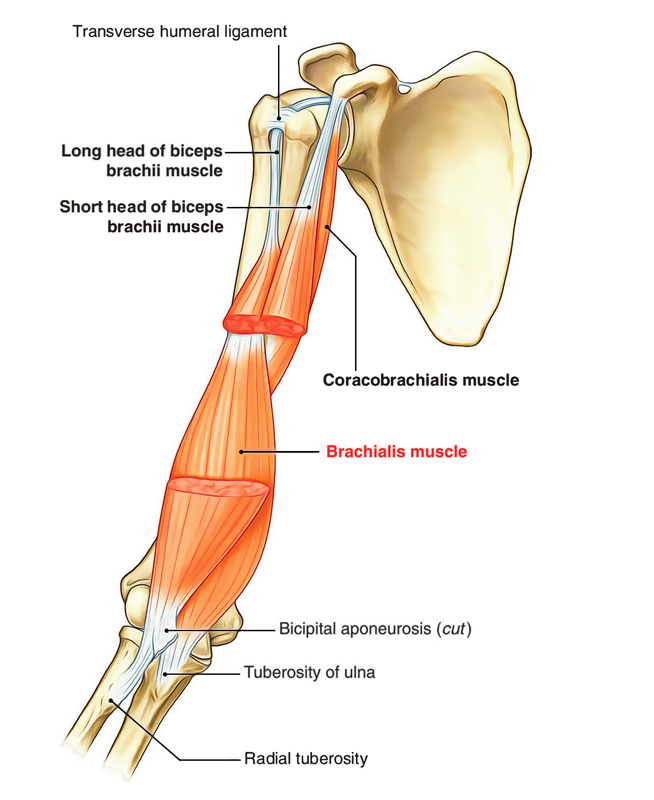 Morphology of the coracobrachialis: It represents the muscle of medial compartment of the forelimb of quadrupeds, which is not well-developed in human beings. In some animals, this muscle consists of three heads. In human beings, the upper two heads are fused and musculocutaneous nerve passes between the two fused heads. The lower third head has disappeared in humans. But, occasionally the lower head persists as a fibrous band (ligament of Struthers), which extends between supratrochlear/trochlear spur and medial epicondyle of the humerus. The median nerve and brachial artery then pass deep to the ligament and may be compressed. From the front of the lower half of the shaft of humerus. Superiorly the origin of brachialis embraces the insertion of deltoid. Into the anterior surface of the coronoid process of ulna including tuberosity of ulna. Medial two-third by musculocutaneous nerve. Lateral one-third by radial nerve. It is the untiring strong flexor of the elbow joint hence it is often called ’work-horse of the elbow joint. Triceps brachii is a large muscle, which forms most of the substance on the back of arm. As its name implies, it has three heads. Long head, arises from the infraglenoid tubercle of the humerus. Lateral head, arises from an oblique ridge above the spiral groove on the upper part of the posterior surface of the shaft of humerus. Medial head arises from the posterior surface of the lower half of the shaft humerus below the spiral groove. The medial head is actually deep to the other two heads but it is named medial because at the level of radial groove it lies medial to the lateral head. The common tendon is inserted into the posterior part of the superior surface of the olecranon process of ulna. Nerve to long head arises from the radial nerve in axilla. Nerve to lateral head arises from the radial nerve in the radial groove. Nerve to medial head arises from the radial nerve in the radial groove. 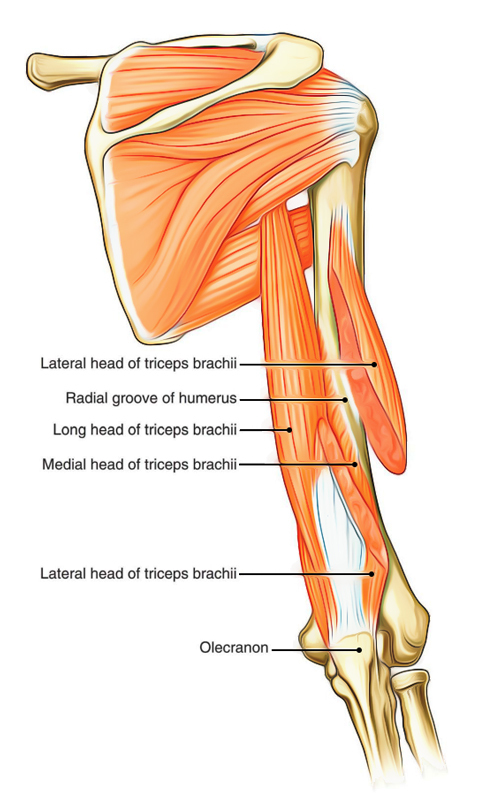 The triceps brachii is the powerful extensor of the elbow joint. The long head supports the head of humerus during hyperabduction of the arm. A few fibres of deep head are inserted into the posterior aspect of the capsule of elbow joint and are referred to as articularis cubiti or subanconeus muscle. These fibres prevent the nipping of the capsule during extension of the arm. Injury of radial nerve in radial groove: If the radial nerve is damaged in the radial groove, the extension of elbow and triceps reflex is not lost because nerve to long head arises from the radial nerve in axilla.